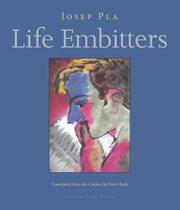 Life Embitters is Pla’s Pandora’s box of surprises, flitting with melancholic irony from one end of the continent to the other in a constant reinvention of the short story. He collects encounters from the streets of pre-Depression Europe: rogues and strays in boarding houses in Barcelona, a Parisian café-owner addicted to gambling on horses, exiles and emigres struggling to survive in a Berlin struck by hyper-inflation and the rise of Nazism, a Greek shipping agent fond of frogs, a flaneur in St. James Park whose pleasure at the sight of sparrows enjoying a morning tryst soon turns to horror when a penguin decides it’s time for a crunchy snack. These crystalline, bittersweet stories confirm Josep Pla as a master of irony in his portrayal of ordinary lives across Europe between the end of the Great War and the collapse of Wall Street. Like Joseph Roth, Pla observes and records the pain and resilience of those around him, and reveals his own.